The Royal Mint’s latest 50p coin is certain to “strike a chord” with Change Checkers. That’s because it celebrates the centenary of the birth of one of the UK’s most prominent classical composers – Sir Benjamin Britten. Born in Suffolk on 22 November 1913, Britten studied at the Royal School of Music before going on to write some of the 20th Century’s best known opera, choral and classical pieces, including Peter Grimes (1945), a Young Person’s Guide to the Orchestra (1945) and the War Requiem (1962). Sadly though Change Checkers will have to wait several months until you can hope to see the new Benjamin Britten coin in general circulation. 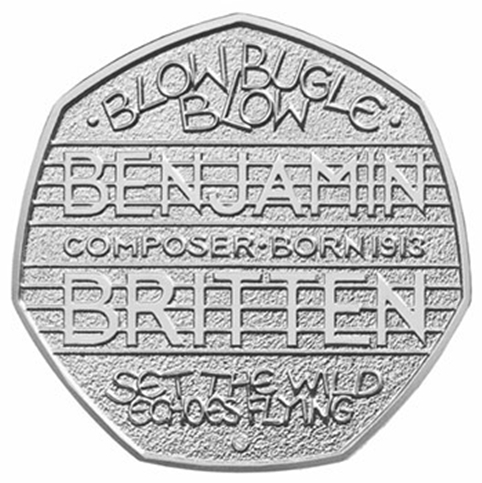 Please note Change Checker will include the Benjamin Britten 50p coin in its 2014 album supplement, which will be available around February 2014.